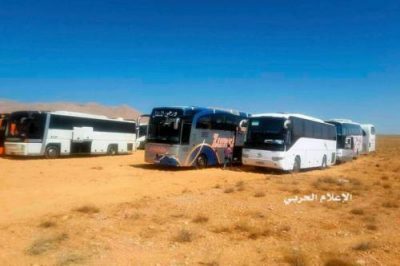 In a bizarre twist to an already unusual story, a convoy of 17 buses carrying Islamic State terrorists and their families has remained stranded since Thursday in the Syrian desert as the US, Russians, and Syrians discuss their fate: attack the convoy or allow it to pass? Regardless of what happens, emerging photos and video depicting ISIS’ retreat from Lebanon as well as their current helpless plight stuck in the middle of Syria constitutes perhaps the most significant blow to ISIS propaganda to date. Earlier this week we reported on the unusual deal which allowed a large convoy of Islamic State fighters and their families to exit their contested stronghold along the Syrian-Lebanese border under the watch of the Lebanese and Syrian armies and Hezbollah after being defeated. As first announced by Hezbollah’s Secretary General Hassan Nasrallah in a speech Monday night, the deal involved the transportation of 26 wounded and 308 ISIS fighters, along with 331 civilian family members via buses and ambulances to Syria’s eastern province. The controversial deal was struck in return for the bodies of 9 Lebanese soldiers, kidnapped by ISIS in 2014. Stranded ISIS convoy: there are over 600 in the group, which includes civilian family members. Photo source: Stripes, via Arabic media. That convoy was allowed to enter Syria but was attacked by the US-led anti-ISIL Coalition on Wednesday as it crossed open desert on its way to the Islamic State stronghold of Deir Ezzor. Per coalition statement, the convoy wasn’t attacked directly – just outlying ISIS vehicles which were attempting to join and bolster the transport. Part of the highway in front of the convoy, including a key bridge, was further targeted in order to stop its movement. After turning around and heading back west from the Abul Kamal area, the convoy of 17 buses containing hundreds of armed ISIS fighters and their families remains in the Syrian Desert between Humayma and As Sukhnah. …In accordance with the law of armed conflict, the Coalition has struck ISIS fighters and vehicles, including a tank, armed technical vehicles, and transport vehicles seeking to facilitate the movement of ISIS fighters to the border area of our Iraqi partners. Food and water have been provided to the convoy. The ISIS convoy had reportedly been on an indirect and lengthy route through Syria, likely in order to avoid air strike, before being halted. On Friday the Syrian and Lebanese governments extracted another concession as part of negotiations over the fate of the convoy: ISIS handed over the body of an Iranian Revolutionary Guard officer to Hezbollah. “I went to President Assad…I went to Damascus,” he said, adding that he sought to convince Assad to let the convoy pass through government territory. “He [Assad] told me, this is embarrassing for us, but no problem,” Nasrallah told supporters gathered in eastern Lebanon for a “victory rally” to celebrate the expulsion of ISIS from the border area. “The Syrian government has put up with the embarrassment for the sake of Lebanon,” he said. Other observers of Islamic State social media accounts have noted that ISIS members have reacted in disbelief, claiming the entire brokered deal and ISIS retreat to be a fiction of Hezbollah media. At the moment, terrorists and their families remain sitting on chartered buses in Syrian no-man’s land awaiting the decision of regional and foreign militaries controlling land and air over Syria. Will the convoy be destroyed or allowed to pass? Will the US coalition strike and kill over 300 civilian ISIS family members in the process? Simple imprisonment could prove difficult as the ISIS militants were allowed to carry small arms as part of the deal and will surely go down fighting at this point. 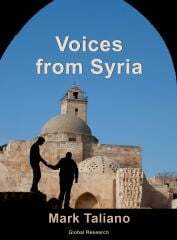 Or there’s the remote chance that the Syrians and Hezbollah actually desire for the US to attack the convoy: the Syrian and Lebanese governments could maintain they upheld their end of the bargain (this becomes important for potential future battlefield deals brokered with other groups), while the US would claim the moral high ground of fighting terror. Whatever scenario unfolds, this currently developing story is arguably one of the strangest to come out of recent events in the war.